Our Fiber Laser range offers a definitive solution for a variety of industrial manufacturing and precision applications, combining excellent beam quality, high efficiency and a small footprint. Offer a complete integrated system capable of providing up to 8kW of power with exceptional levels of control for a wide range of industrial cutting, welding and drilling applications. Require only an electrical and chilled water supply in order to produce 3-8kW of Laser power, delivered in Fiber outputs up to 20m in length. Deliver continuous, reliable performance with output Fibers of 50μm and 100μm producing M2 values of 6.5 and 15 respectively. This versatile Laser offers an additional range of flexible delivery options, including beam-switch time-share, which maximises productivity by eliminating system load and unload times, and energy sharing that can help avoid the distortion of sensitive components by enabling users to simultaneously weld at multiple locations onto one part. This control interface incorporates a user definable arbitrary waveform generator: extremely useful in providing a controlled and repeatable ramp down of Laser pulses when welding. 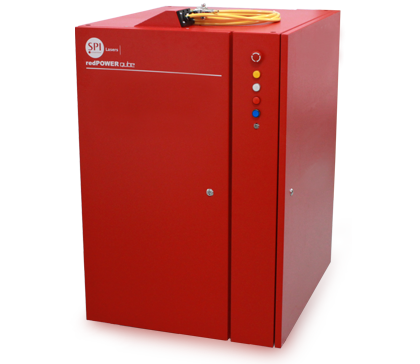 The redPOWER® Lasers have inbuilt back reflection monitoring and protection – providing the user with potentially useful process feedback information, as well as reducing the risk of damage to the Laser from back reflections.